I would like to introduce you to Uwineza Benjamin. He is a 2012 secondary school graduate and was sponsored by Global Capacity for his last three years of school. He studied in the Physics, Chemistry, and Math section and finished with high marks to continue with a scholarship to university. He has been attending university and recently graduated with a bachelor’s degree in biomedical engineering. When Benjamin chose this university program, it was only the second year that it was offered at any university in Rwanda. He was very interested in this subject and hopeful that he would quickly be able to find a job upon receiving his diploma since there would be minimal competition for jobs with such a new degree program. During his time in university, he was also able to take some additional courses to follow another passion of his: digital multimedia. As an artist, he is excited to use his talents in this way for advertising, television, animation, and other types of projects. Benjamin is working hard to find a job upon completing his university program. Unfortunately, it has been more difficult than he anticipated to find a job in the biomedical engineering field. While much development is occurring here in Rwanda, there are still only a few hospitals with the equipment that would require the skills of a biomedical engineer for use and maintenance. He is hopeful that as things continue to progress and more hospitals and medical facilities are built that he will be able to find meaningful work related to this degree. He is also looking for opportunities in the digital multimedia job market here to use these skills. Sadly, Benjamin’s mother (a widow) recently passed away and he is now the head-of-household and caring for his three younger siblings (one in university, one in secondary school, and one in primary school). His mama had been sick off-and-on for a little while but suddenly lapsed into a coma and passed away very quickly. It has been difficult for these children to mourn the loss of their mother and figure out what life will look like in the days ahead. Thankfully, they own their home and have several units within their compound that they rent to other families and have a little bit of income from. We are hopeful that Benjamin will be able to find full-time employment soon! We will continue to support and encourage this family and walk with them on this next part of the journey. Thanks for your part in that, too! Much of the work that we do in Rwanda would not be possible without the dedication of our Program Assistant, Nsekuye Jean Bosco. He has been working in this capacity for the past ~4 years (as well as also helping with various tasks over the years for A Voice for Rwanda). I would like to share a little bit of his story with you. Bosco was orphaned when he was four years old and grew up for several years after that with his older sister and brother in an orphanage in Kigali and, thankfully, was able to attend school. Early in his secondary school years, the orphanage closed and he went to live with some of the other older boys from the orphanage in a Remember Me Home sponsored by A Voice for Rwanda. As he progressed through secondary school, he was a fair student but did not excel in the classroom and was otherwise focused on playing football. Thankfully, A Voice for Rwanda encouraged him and was willing to continue paying school fees even when he wasn’t doing his very best, especially during his S-4 year. When starting school the following year, Bosco changed his focus and began to pay more attention to his classes and less attention to playing football. He switched his section from MCB (Math, Chemistry, Biology) to CSM (Computer Science Management) and began to understand that he wasn’t a bad student but he personally needed to care about his studies and put forth his best effort. At the end of that year (repeating S-4), he was ranked first in his class! He also decided that switching from being a day scholar to a boarding student would allow him to continue focusing more consistently on his classwork. It was in this S-5 year that Global Capacity started providing secondary school scholarships for the kids in the Remember Me Homes. At boarding school, Bosco worked hard and did his best, competing with the other students for high grades and a high ranking at the end of each trimester and school year. He also greatly appreciated the visitation at school by Global Capacity staff members as it encouraged him to know that someone cared and thought about him while he was at school. In his final year of secondary school (S-6), Bosco was very focused on his studies and worked hard to try to get a government scholarship to attend university the following year. He had that goal in mind so that he would go one step further in his education than anyone else in his family had previously. He finished the year and scored well on his national exams but was just a few points below the threshold for a scholarship for university. Thankfully for him, Global Capacity was focused on investing in the lives of the students more than just providing school fees. Upon finishing secondary school, he began looking for a job. He was offered a part-time position with A Voice for Rwanda helping with some office tasks and an after-school program for primary school kids. He was grateful for this opportunity to invest in the ministry that had greatly invested in him. While in the office, he would also occasionally help the Program Assistant (at that time) working on Global Capacity tasks. When that Program Assistant resigned, Bosco was recommended to fill that position and continue helping with Global Capacity activities. His compensation for these efforts: fulfilling his dream of going to university! In the past four years, Bosco has learned a lot in working with the families, secondary students, school administrators and teachers, and local government officials on behalf of Global Capacity. Even in some challenging times, he is grateful for all that he has learned through this working experience, and, upon completing his university classes and degree, he will be continuing as a paid employee as Global Capacity’s Program Assistant! He truly knows and believes that we are touching the hearts and minds of the students that we sponsor, allowing them to have great peace as they progress through secondary school. We are so glad to be able to come alongside these students and appreciate how Bosco helps us continue to encourage their hearts and help them build a strong foundation for life. Thanks for joining us in changing the lives of our sponsored students...including Bosco! I would like to introduce you to Ndateba Ivan, one of our Secondary 6 (“senior”) students. He is in his final year of traditional school in a section that focuses on Biology, Chemistry, and Geography. 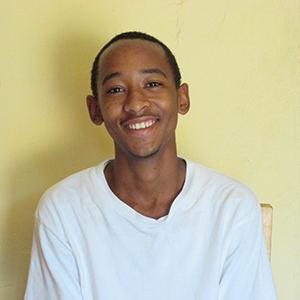 Ivan has been one of our sponsored students since beginning Secondary school in 2012. He has a couple of older siblings and a couple of younger siblings who are also past and present Global Capacity students. Secondary school here in Rwanda can be very difficult for some students. During the first three years (S1 - S3), they can be learning up to 18 different subjects at one time. At the end of those first three years, they are required to participate in a national exam that tests them on as many as 13 of those subjects.WOW! Much of the time spent in the classroom consists of copying all of the notes that have been written on the chalkboard by the teacher and memorizing all of this information, without access to textbooks to supplement the material. With so many different subjects, it is not surprising that many students do not fare well on these exams. Upon passing this national exam and moving ahead in the last three years of Secondary school, the students are placed in or choose a concentration of study. This is often based on the classes that they scored highest in for the national exam at the end of Secondary 3. The section is sometimes a combination of three subjects (i.e., Biology, Chemistry, Geography [BCG] or Computers, Economics, Mathematics [CEM]) or it could be something that is a more technical trade like Construction or Electricity or Hotel Management. In this upper level of Secondary school, the students can focus on their section as well as usually just a couple of additional courses like English and Entrepreneurship. Once again, at the end of Secondary 6, the students participate in a national exam that tests them on everything that they learned from S4 - S6. This is an extremely stressful undertaking as future possibilities can be dependent on these exam results. Ivan struggled during the first few years of Secondary school but was promoted to continue into the upper levels in the section of Biology, Chemistry, and Geography. His overall average improved slightly with the focus on a smaller range of subjects, but he has struggled in the main courses for this section which are what his national exams will focus on at the end of this school year. When we met with him prior to the beginning of this school year, we could tell that he was discouraged and worried about his performance especially looking ahead to the national exam. So, we wondered if we might be able to get some assistance from the teachers at his school to provide some extra coaching (tutoring) for him. Thankfully, the headmaster and the teachers were agreeable and willing to spend some extra time with Ivan (and two other GC students at the same school) to help them improve in these main subjects (with some supplemental pay). At the end of the first trimester, I was eager to see if there would be a noticeable difference on Ivan’s bulletin (report card). There was!! I was so proud of him as he had improved his scores compared to last year in his three main subjects…AND all other subjects, too. It seems that having some extra and individual attention has made a great difference for Ivan. Possibly more importantly, I think that Ivan is encouraged in knowing that we believe in him and that he is capable of improving even if it’s in small steps. I’m grateful if this is what he learns through this experience. I'm grateful for your partnership in helping to encourage Ivan in ways that I hope will impact his confidence for the exams as well as hope for his future ahead! Creating the packages of personal items: bath soap, laundry soap, lotion, toothpaste, and Kotex (for the girls)! While a break from the rigors of studying is always nice, part of the reason for the timing of this school break is to coincide with a week of remembrance that begins on April 7. This week is a somber time where Rwandans remember the genocide against the Tutsi that occurred here in 1994, spanning one hundred days and killing over one million men, women, and children. All were affected by these horrific events whether directly or indirectly and it is something that has shaped the past, present, and future of this country and its people. Over the past 23 years, there has been an incredible amount of healing and reconciliation amongst the people as they focus on being unified in hoping for a better future. During this week of remembrance, there are many gatherings, often by small villages. The people assemble together to share testimonies and parts of their stories and the local leaders share messages of how the community can and should be working together towards peace. Sadly, there are some who still maintain the genocide ideologies, which are also addressed during these gatherings with the hope they will be rejected and unity can be promoted among all Rwandan people. May it be so! The official remembrance logo and motto this year. The Easter holiday also fell during this break, so the students were able to be with their families for this special time. I joined a few friends in going to a Rwandan church (instead of the church I usually attend with English services) to experience the way that they celebrate this holiday. In some ways, the Easter message can be associated with that of this time of remembrance of the genocide—that darkness and evil had some time of reigning yet through much sacrifice comes a new day full of hope. During this break, we also arranged a special time to celebrate our recent graduates. We had five students who finished traditional secondary school at the end of 2016 and four students who completed vocational training by February of this year. It is so exciting to see their journey so far and the efforts that they have made! We will continue to encourage and guide them as we can and have great hope that they will soon be able to secure employment that helps them to continue moving forward in independence and self-sustainability. At the graduation ceremony, Yvonne shared a special message for both the graduates and our other current Global Capacity students who were also in attendance. She has a gift for speaking words that are encouraging and challenging and even convicting…to really help our students understand the gift that they are given in pursuing an education and that it also requires their best efforts and follow-through on their responsibilities. We also had a few local government officials in attendance and several of them were able to address the students. After these speeches, we handed out certificates to each of the graduates and offered Fanta (soda) and amandazi (little donuts) for everyone! The final portion of the celebration was taking the graduates and their parents or other family/friends out to lunch to share a special time with just the graduates. It was a fun day! Feasting with the graduates and their family/friends...enjoying goat brochette (skewer of meat), a plate of chips (French fries), and another round of Fanta. Yum! And, personally, this graduation celebration allowed me to host my first overnight guests: Yvonne [our prior Program Director] and five of her kids! It was quite a bit of chaos but SO fun to have some extra activity in the house and share some fun meals together. Thanks for partnering with us to make a difference in the lives of these students and their families. Creative use of the exterior walls of a classroom building at a school near Kayonza. Today is the official end of the first trimester here in Rwanda. Many of our students finished their end-of-term exams a week ago and have been eagerly awaiting their bulletins (report cards). Recently, as we have been doing student visitations at various schools, it has been apparent that our students were trying to finish well with their exams. The students at boarding schools remained at school this week even after finishing their exams to give the teachers time to grade them and produce their bulletin for them to carry home. We expect a flurry of students to visit our office next Monday to give us a copy of their bulletins! This is the shortest term of the three in a school year as it begins in late January and finishes in time for all of the students to be home for the week of mourning (remembering the genocide against the Tutsi tribe that occurred in 1994) from April 7-14. I have not been here during the week of mourning before and will see what the week holds, but generally everything closes on April 7 and 14 and in the days between businesses are only open in the morning, allowing for special services and time spent with family in the afternoons and evenings. It will be a solemn time of remembering this difficult part of the history in this country but also celebrating the reconciliation and restoration that has happened since. I’ll share more in the next update! We will also be hosting a graduation ceremony on April 5 to celebrate our five students who completed secondary school last year and our four students who completed vocational school training. I look forward to sharing more about this celebration next month, too! See below for a student highlight and recent video! Masengesho David is in Secondary 5 and studying Electricity at a school about an hour and a half southwest of Kigali. 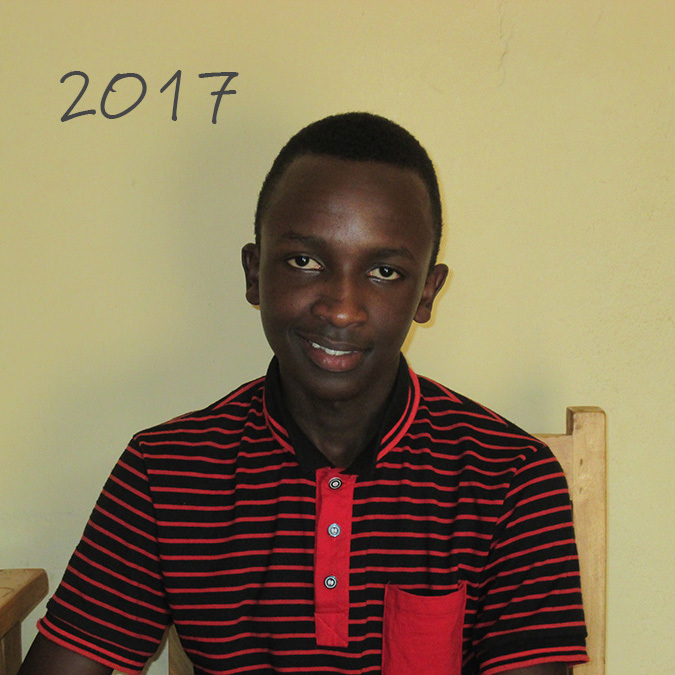 When we met with David before the start of this new school year, he told us that he was enjoying being at boarding school and was proud of himself for how well he was doing in his classes; he could focus and not worry about paying school fees thanks to Global Capacity’s sponsorship. However, he also told us how he struggled last year with sickness (malaria) while at school and had to return home several times to recuperate. This creates a difficult situation for students at boarding school as they miss classes and have to pay for their transportation home and back to school. David’s family struggles to pay their rent without these added expenses for transport when David became sick. He is one of the older children in his family and, thankfully, was able to find an internship to help earn some money during the long break from school. His mama is extremely hard-working but has had some health issues herself and has not been able to find on-going work. While David enjoys being at boarding school, partly because he consistently gets three meals a day, it also makes it difficult to return home where his family often eats only one meal a day. However, when he is away at school, he worries about how his family is doing. Prior to this new school year, we tried to find a different school for David that would be closer to home in case he continued to become sick and could have reduced transport costs. Unfortunately, we could not find another school that would do well in David’s section of Electricity, so we enrolled him at the same school as the previous year, praying that he would have less sickness this year. We visited David at his school this past Saturday and are grateful that he is doing so well. He told us that the school is doing well in taking care of them and David has not been sick at all during this first trimester! What a good report! I’m so grateful that he has remained healthy and is thriving at this school and hope this continues for the remainder of the year! Pre-parents' meeting entertainment at one of the secondary schools in Kigali. We are celebrating two of our students, Uwizero Lydia and Umutoniwase Fiette, who just graduated last Friday from a 15-month vocational school (Esther’s Aid) with a focus in culinary arts. This course of study includes a full year of classroom training and then a three-month internship at one of the local hotels. This has been an exciting opportunity for Lydia and Fiette to gain some skills that will hopefully make them very marketable and allow them to obtain jobs in the catering industry here in Rwanda. 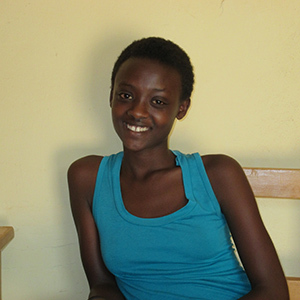 Lydia and Fiette are both students who struggled in the traditional secondary school system. They tried their best in the classroom but received low marks and were still promoted to the next grade levels which often is not in the best interest of the students. Instead of continuing to repeat classes and grades in the traditional school, Lydia and Fiette were offered an opportunity to attend this vocational school and learn in a different way. We got a sneak peak into the training kitchen though we weren't allowed to enter for sanitation reasons (which is a good thing!). But, we did get to sample a cookie...YUM! During the graduation ceremony, held at the Kigali Serena Hotel, the founder of Esther’s Aid shared with the graduates and parents their focus on three things: education, skills development, and empowerment. It was quite apparent that the teachers and administrators of this school care deeply for the students and make their best efforts to train them well and prepare them for their future endeavors. I am so hopeful that the futures for Lydia and Fiette have been shaped by their time at this school and that they are also hopeful for what lies ahead. We’ll continue investing in relationships with these two ladies as they continue on their journey. More to come! As the leader of the 2017 graduating class shared in her speech, “We can make ganache and give life to the people.” May it be so! A graduation ceremony isn't complete until there is a showcase of traditional Rwandan dancing! Enjoy! Check out the blog post below to learn about our first Saturday of student visitation this year! It was also great to meet the Minister of Education for the Kicukiro District of Kigali where this school is located. I look forward to connecting with him more in the coming year! 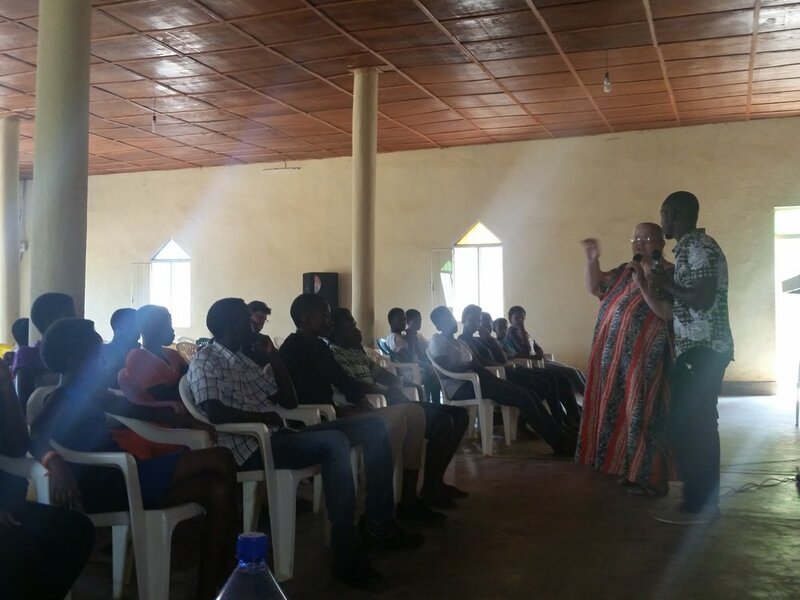 Our New Program Director is in Rwanda! Just a quick update letting you know that I (Hannah, the new program director for Global Capacity) have arrived in Rwanda! I am easing into this new culture and look forward to learning from Les and Yvonne Parr as well as Nsekuye Jean Bosco all that they have been doing to keep our scholarship program running. I'll be posting more updates as the journey progresses!